Avoid contact with eyes. If contact occurs flush with water. 1. Remove old nail polish or other product from your finger and toe nails. 2. Gently brush the Medessence PLUS Homeopathic Nail Solution over nails, nail tips and surrounding cuticles. 3. 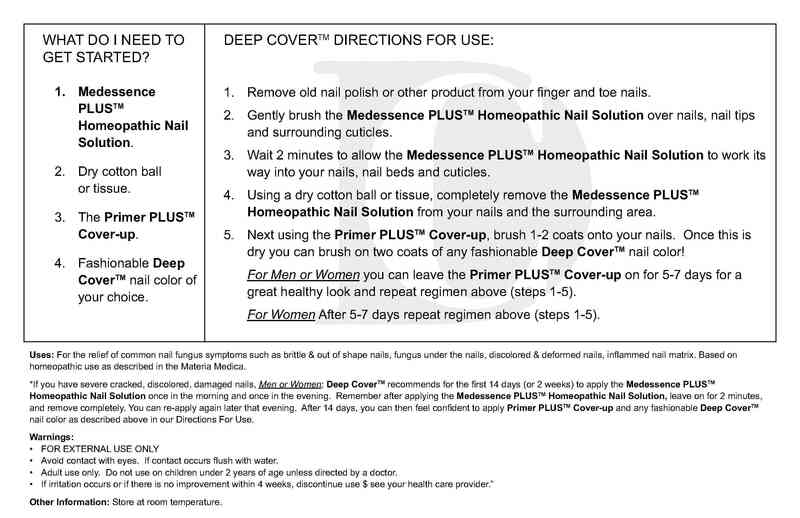 Wait 2 minutes to allow the Medessence PLUS Homeopathic Nail Solution to work its way into your nails, nail beds and cuticles. 4. Using a dry cotton ball or tissue, completely remove Medessence PLUS Homeopathic Nail Solution from your nails and the surrounding area. fashionable Deep Cover nail color. For Men or Women you can leave the Primer PLUS Cover up on for 5-7 days for a great healthy look and repeat regimen above (steps 1-5). For Women After 5-7 days repeat regimen above (steps 1-5). 2. Dry cotton ball or tissue. 3. The Primer PLUS Cover-up. 4. Fashionable Deep Cover nail color of your choice.